As the quintessential online marketplace, Amazon is a shopper's (and seller's!) paradise, offering a wide range of products that are available both from the company's own warehouses and through approved third-party merchants that are authorized to sell through Amazon's platform. If you happen to shop at Amazon.ca often, you may have considered joining Amazon.ca Prime. The upgraded service has several advantages, including free two-day shipping, unlimited photo storage on your Amazon.ca account and access to exclusive deals and shopping events. Joining usually entitles you to a free trial period, after which point the service costs about $80 per year. NOTE: Because not all Amazon products are sold directly by Amazon.ca, the two-day free shipping offer will not be available for all products, even if you're an Amazon Prime subscriber. For those who shop at Amazon on a regular basis, the Amazon.ca credit card may be quite advantageous as it earns gives 2% cash back on every $1 spent at Amazon.ca and 1% cash back on every loonie spent elsewhere. Every time the rewards reach $20, a credit is automatically applied to the card. Product-specific codes (i.e. $25 off $100 spent on Star Wars themed merchandise). Category-specific codes (i.e. 30% off products in the toy department). Found an Amazon.ca discount code you can't wait to use? After clicking on the Amazon deal you'd like to use, copy the code, and head over to Amazon's site. 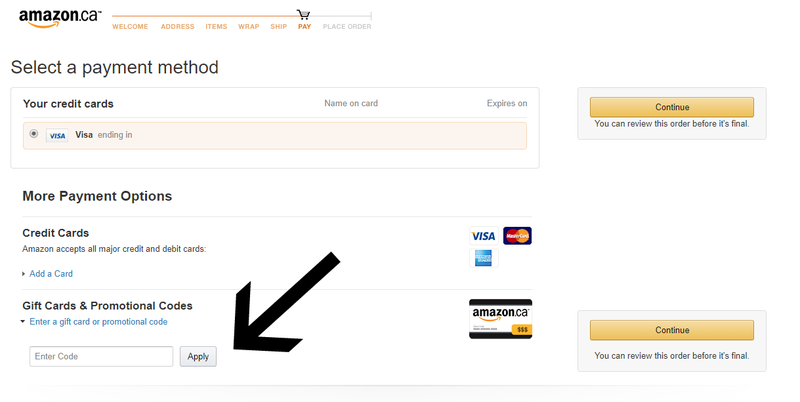 Enter the Amazon promo code in the "Gift Cards & Promotional Codes" field of the Payment section and click "Apply". Amazon is one of the top online shopping websites in Canada. Find deals on electronics, tools, clothing, shoes, accessories, sporting goods and so much more. We’ve got you covered with the best Amazon coupon codes and the next prime day deals.